Head chef Murrali’s philosophy is: “if you do your job perfectly and honestly, you will reap the rewards”, and the perfect, honest food at Eastern Eye reflects just that. 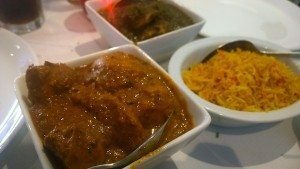 Located at the Preston Park end of the up and coming London Road, Eastern Eye is what I believe as Brighton’s best kept Indian restaurant secret. Murrali has cooked in many luxury hotels around the world, and is from Madras, India where his knowledge of authentic Indian cooking originates from. It wasn’t until a fellow foodie recommended Eastern Eye to me, that I considered paying the Indian restaurant a visit. From the outside, it is slightly hard to see in, with large windows covered in menus and a white tint. Only the true locals will know that those windows hide many very tasty Indian dishes that will be hard to find that good anywhere else. On this particular visit it was a Wednesday, and we had been once before after a few drinks after work. Both times were not overly busy, but our waiter said that weekends are when they are mostly full so it would definitely pay to book at table then. I really liked that it was a bit quieter, as we had a very personal service, there was no wait for food and we were very well looked after. They also have a flat screen tv on the wall with a slideshow of enticing images of Indian food and Indian monuments, temples and scenery, making you just want to pack up all of your bags and escape to India right away. The menu is a good size, not too big, and when I asked for the gluten free selection, the waiter was happy to let me know per menu item if it was something that I selected. When he spoke about the dishes you could tell that he was so passionate about the food, he had a lot of respect for what Murrali does, and he was excellent at asking what sort of dishes we usually liked and for making recommendations. There are a half a dozen non vegetarian starters to choose from, and the same amount that are vegetarian. For the mains you have seafood, lamb, chicken and vegetarian, Biryani (which is what I want to try next) and your classic favourites such as Tikka, Korma and Vindaloo. You can choose from a selection of sides, or Indian breads to accompany your meal. 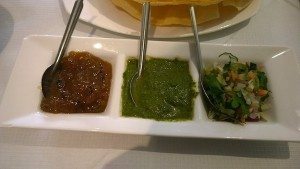 We started with some poppadoms, which were nice and crunchy, and they came with lovely tangy mango chutney, mint yoghurt and a raw onion and vegetable salad to top them with. 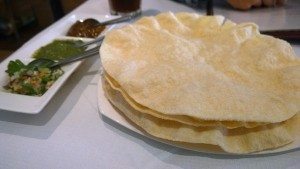 It’s exciting for us that they have Dosa on the menu, this is something that my partner and I ate a lot of while staying in Penang in Malaysia, where there was an Indian lady selling them on the streets. Masala Dosa is traditionally served either for breakfast or for lunch, and has a number of different types of fillings, and mainly eaten in the Southern part of India. Eastern Eye make theirs properly, with freshly ground rice and lentils that have been soaked overnight, and ground in a stone grinder that they imported all the way from India. They are traditionally gluten free, and this recipe is for sure. We decided to share a chicken one, with shredded tikka chicken, and spicy potatoes. I would say that the diameter is about half a metre long, and is packed with delicious spicy filling, with crispy edges and soft pancake centre. 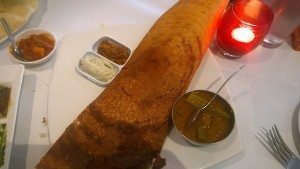 The dosa is served with a ginger chutney and a coconut chutney, with a lentil dhal with ladies fingers (okra) on the side. It really was incredibly tasty, and I don’t think I can say I’ve had a better one anywhere else. We also shared to start the Masala fried fish, which is also gluten free! 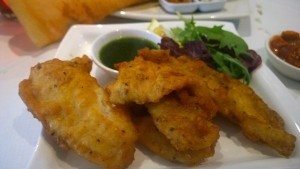 It is coated in cornflour and plenty of seasoning and spices, then fried until crispy perfection. The fish flakes away beautifully, and it is served with a sweet minty dipping sauce that balances out the other components so well. For the mains, my boyfriend asked for a recommendation, as he knew he felt like chicken but didn’t know where to start. The friendly waiter recommended the Quilon Chicken – mild Keralan curry with coconut, curry leaves, ground coriander and green chillies. Last time we came, I ordered the Lamb Shank Narendra which melted in my mouth, but I couldn’t order it again as I wanted to try something else! I saw that they had the Goan coriander and fresh green chilli curry, cooked with fresh herbs and braised in it’s own stock. This is one of my favourite curries to eat, as it is spicy but fresh and light, not so heavy like some curries can be. To be honest, we were quite full after the dosa and the masala fish, but I couldn’t wait to try something else that delicious, so we had to go for more. Most of the main dishes are gluten free, but it is good to double check with your waiter just in case. My Goan curry was spicy, with so many subtle flavours going on, you could really tell that the paste was homemade and made specifically for this dish. My partners’ curry was so rich and creamy, and incredibly more-ish, even when I was full I had to keep going in for more. The chicken was super tender, and just came apart with a spoon. We shared some pilau rice as well, which was full of lots of spices, star anise in particular. When we complimented the waiter on the food, he said that unlike some other Indian restaurants, each curry has their own paste, so no two dishes will be the same. We could definitely taste the difference in the food at Eastern Eye to other places we have eaten before, real home style cooking, with real knowledge of ingredients and honest passion. The dessert menu consists of three items, homemade sorbet, and two other Indian traditional sweet dishes. Firstly the Kulfi – a traditional Indian dairy based ice cream. It is not whipped like Western ice cream, so it is really creamy and a little more dense. And secondly the homemade Gulab Jamun – a sort of sweet dumpling made from milk solids and a little bit of flour (not gluten free) and soaked in a sweet syrup. Unfortunately we didn’t get to try any of the tasty sounding desserts, as we were just too full from the rest of the food, and I didn’t want to waste anything by not eating it! 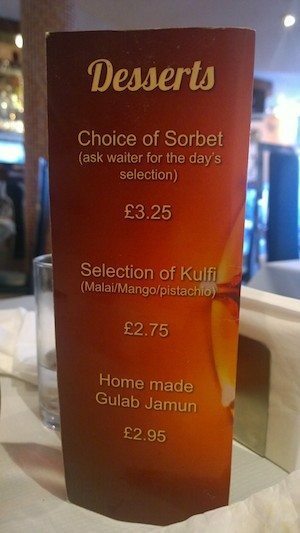 I would love to try the Kulfi though, it sounds delicious! 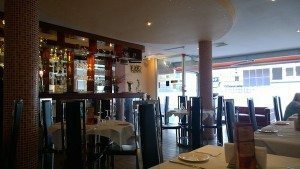 As a gluten free diner, I think Eastern Eye is a perfect night out, with a good choice of starters to choose from, plenty of mains, a couple of desserts (if you get that far) and of course the wonderful masala Dosa. The prices are very fair with the Dosas and curries hovering around £7 each, and starters are nearly all under £5. If you order takeaway, the prices are 15 – 20% less than the menu price, except for seafood. 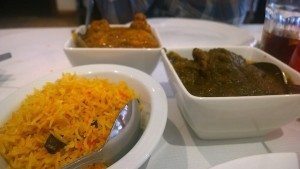 If you haven’t been to Eastern Eye on London road yet, make that your next place to go for an Indian meal with proper, homemade Indian cooking. Don’t miss out!